Anne Willian is a English Chef and owner of Ecole de Cuisine La Varenne in Burgundy France. She is in position 27 on the list of Gourmet Live 50 Women Game-Changers in food. She has been a cooking teacher for over 35 years. She is also a cookbook author and columnist. She is the authority on French cooking and her cookbooks have been widely published and translated into more than 24 different languages. She received her Masters Degree from Cambridge. Soon after, she studied and taught cooking in London and in Paris. She finally settled in the United States where she became editor of Gourmet Magazine. She later moved back to France to start La Varenne, the prestigious cooking school. I am a big fan of French cuisine. Not the stuffy hard to make sauces. More like the peasant food from the Brasseries and Bistos. This is a recipe you might find in any of those places. Here is her simple yet elegant Scrambled eggs with wild mushrooms. Clean mushrooms with a damp paper towel. Melt butter in a frying pan. Add mushrooms and saute about 5 minutes. Add parsley, chives, salt and pepper. Remove mushrooms from pan and set aside. Whisk eggs in a bowl. Melt the remaining butter in the frying pan. 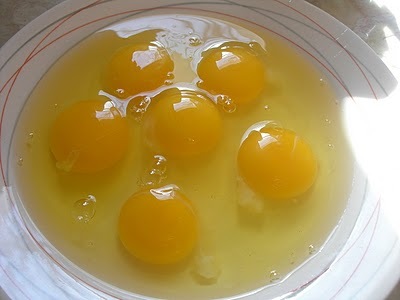 Add the eggs and cook stirring constantly until the eggs begin to thicken. about 5 minutes. Add the mushroom mixture and serve immediately. 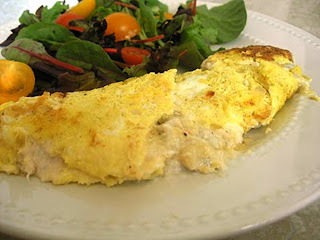 The following bloggers are also featuring the recipes of Anne Willian today. It sounds like the perfect dish to me to highlight French cooking. It is not all about high faluting sauce and presentations! I love, love, love breakfast food (at any time of the day). This is exactly the way my parents have made their eggs (sans mushrooms) my entire life. They look perfect. These eggs look great, I notice that many of Anne’s recipes feature wild mushrooms. 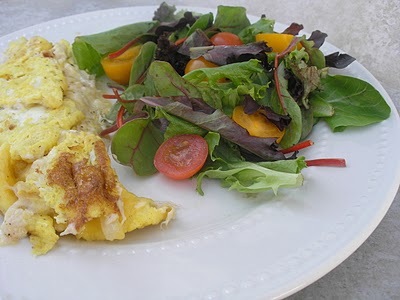 I would love that beautiful salad and the eggs for any meal, you definitely got that ‘bistro’ feel with this dish. Mmmm, I love wild mushrooms, and mushrooms are about my favorite omelette/egg dish ingredient ever. Wonderful post! I’m sure those scrambled eggs taste great, but my eyes went straight to that salad. Oooh…these eggs look delicious with the wild mushrooms. I love eggs and mushrooms but I would have had to add some cheese in mine. Perfect with a lovely salad! What a simple but satisfying dish of eggs – I could eat this for dinner. Mourning my chives that are under snow – but want this for breakfast. Such a warming, earthy, satisfying way to start the day. Such an interesteing woman and your eggs look yummy! Love any kind of mushroom! I love having eggs for supper. We will have to try this. I’ll have to try this, I have never done mushrooms in eggs. I love pairing mushrooms with eggs and your scrambled eggs look delicious!